Breeding Clownfish | Saltwaterfish.com Forums for Fish Lovers! i am about to start to breed clowns this is my set up so far. the sides have all be painted black. the rotifer tank is the ten gallon but they will be raised in dishes and the 500ml cointainers before making it to the tank. all is in the pic. anything seem to be missing.?? i will have this set up and running by tomorrow and will be posting pics from start to finish. i have also made up some diagrams as to what each system will look like to help others build one. the 2nd pic is one diagram of my nannochloropsis sytem when its all set up. oceana you big meany. lol, did ur thread get deleted? yep it did. i knew it would. but it made me feel better. thanks for your input but again i'm sure the person i was talking about would be glad to hear it now but not sure why you would put this in a non related post. please dont take away from my topic. So it wasn't me? lol you need to tell me if it was me or not. again please keep on subject, noone wants to read mindless bickering. My question is realeated the breeding of clownfish. if you wish to speak about somthing else maybe you could begin a new terad in the appropraite forum. okay okay, but its bangguys b-day today, so he probably won't be back till tomrmow. WOW. Looks great. I usually only grow plankton in the summer outside. I don't have the patience for it I guess. 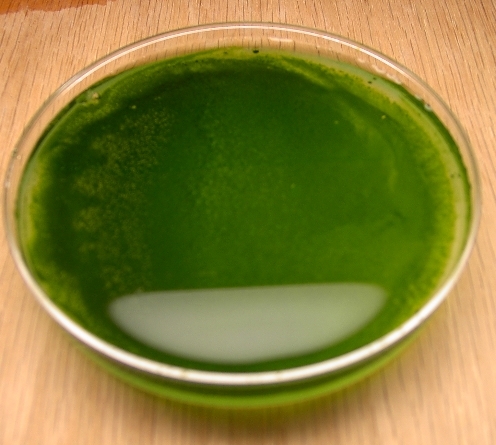 Be sure to use a nutritious algae because Rotifers are only as nutritious as what they eat. Instant Algae makes an excellent alternative. Are you batching the Rotifers or continuous culture? I found that the culture crashes less often with batching but you have to time everything right. It wouldn't hurt to buy a small bottle of Nanno from Instant Ocean and stick it in the freezer just in case you crash your culture at a bad time. Do not place the rotifers anywhere near the phytoplankton culture. Just one single Rotifer launched by a popped bubble will decimate your Phyto culture. oceana- looks like your going to be pretty bussy for a while. Good luck. Keep us posted on your progress. Instant Algae makes an excellent alternative. Would this be in place of making your own greenwater? 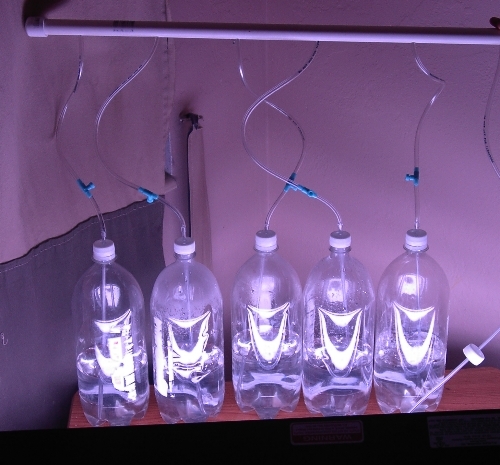 I finished putting together my greenwater system I’ll post the pic tonight. The book I have been reading seem as if you will need so much of this stuff that the only way is to make it yourself. Do you find this untrue?? I was going to do a continuous culture so that I don’t have to buy more?? Is this wrong or just not as good? I have a nice thick book so I’m sure it talks about this. I will have to read into it and research the pros and cons of both ways. 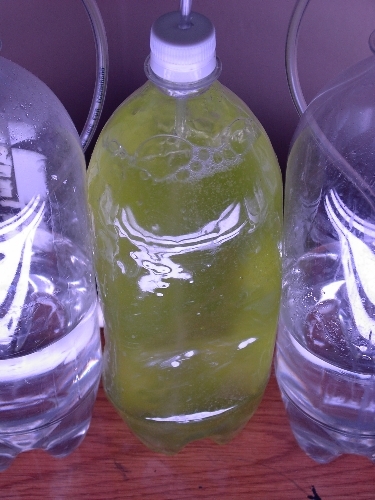 I just started my green water last night so a have a few days until I start the rotifers. I want to have the green water ready to feed. Hmm I did a search and can’t seem to find this?? What is it for?? Premade greenwater or something?? Ahhh great last note. They would have been right next to each other. Makes sense since the "breed" so quickly they would eat up all my green water in a hurry. Thanks. Last night I put 25ml of water into my algae culture dishes. Tonight I plan to put them into a 2 liter bottles to allow them to grow out. I have eggs coming that should be hatching sometime this weekend. My green water wont be ready I don’t think so I have some roti-rich to feed the rotifers until it is. One question I have is once I put the algae into the bottle how do I get more into the other bottles?? Do I simply let it grow out in the one and then pour some into the others?? 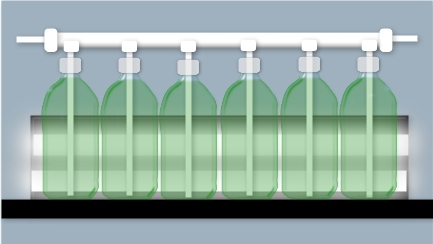 I was going to put a little in all the bottles but in reading I found that you want to put a high amount in each growout container so that it is the strongest thing in there in case it has to beat out any other bacteria. For your Phyto, add 25% of a finished batch back into an empty bottle, add water & food and start the culture over. Feed the other 75% to the Rotifers. For the Roti culture, same thing, don't harvest the entire culture.... Always have at least two cultures going in case of a crash. Also, harvest your Rotifers even if you don't have any larvae to feed them to. Just feed them to your reef tank. With a contunuous culture you want to keep the density low. Do you have a filter to harvest the Rotifers with? You don't want to use the Rotifer water in your larvae tank nor your reef tank. I have a large species of rotifers so I use a 500 mesh screen. For smaller Rotifers use a 63nm plankton filter. thanks again. I will be posting lots of pics as i go threw this. no matter how it turns out i plan to post pics good or bad. sure hope its good however. We could make our own phytoplankton?? Is that what I am reading? If so thats fantastic and interesting... though im too lazy to do such things that i'll probably just go to the store I would be interested in knowing exactly how the process works however. in my case i am using nannochloropus..
you buy them in small disk that contain the algea. once you reanimate the culture you place them into larger containers under certain lighting condition until they grow out to the desired density. then i will use this to feed Rotifers which will then be the main food source for clown fish fry. there is a bit more to it then that but thats the readers digest version. to learn more you can purchase the Plankton Culture Manual from florida aqua farms. i read somewhere that you don't actually need lights to culture. also do you need to run that thing continuously or only as much as you need? read somewhere that you don't actually need lights to culture. this rings half true for the rotifers but not at all true for the phytoplankton. The phyto is after all a micro plant and NEEDS the red and blue light in order to photosynthesis and grow to useable numbers. Although the rotifers do not have to have light most researchers if not all agree that the lighting helps in the rotifer life cycle and plays a important roll. lighting should be around the 2000-5000lux range and have a photo period of 16 light 8 dark. yes and yes. i need to run it full time for as long as i need. once you stop the culture and after the life cycle its a dead culture and needs to be started all over again. you must keep it going in order to maintain the cultures.